yphosis refers to a forward bend in the spine. 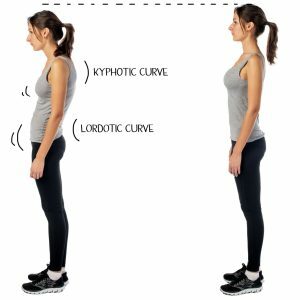 In a normal neck (cervical spine) and lower back (lumbar spine), there is a natural backwards curvature known as a normal lordosis. It is when this natural backwards curve straightens, it is called loss of lordosis. Furthermore, if this straightening progresses to a forward bend, then it is called kyphosis. A typical thoracic spine natural forward bend is between 20-40 degrees, known as normal thoracic kyphosis. Abnormal thoracic kyphosis occurs when this bend increases to more than 40 degrees. Kyphotic deformity is the result of poor posture. However, it can be treated with aggressive strengthening exercises and postural training. Kyphosis can also result from vertebral compression fractures, which can cause “wedging” of the vertebral bodies, throwing the spine into an abnormal forward bend. Kyphosis forces the spine into an unnatural and unbalanced alignment, and therefore the muscles in the spine cannot function efficiently. Consequently, these muscles are prone to fatigue and spasm, both of which can cause a great deal of neck and back pain. In addition, the abnormal alignment of kyphosis increases stress on joints in the spine. This can accelerate the damage of daily wear and tear, leading to advanced arthritis of the spine, or spondylosis. Finally, an excessive curvature can decrease the space available for internal organ such as the lungs and intestines. Kyphosis occurs when the vertebra become wedge-shaped causing a curvature of more than 40 degrees. The expert neurosurgeons at North Jersey Spine Group (NJSG), who are both brain and spine surgeons, along with a non-surgical treatment team, excel in all spine conditions whether they respond to conservative treatments or require surgery. Offering multiple facilities spanning from Bergen County to Morris County, including the towns of Parsippany, Paramus, and Landing, NJ, patients are encouraged to learn the most effective back pain relief treatment for their case by contacting the award-winning group at NJSG today.